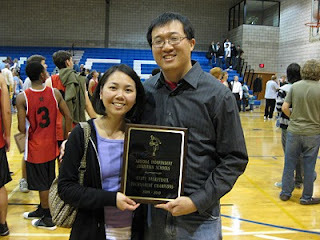 My husband is a high school basketball coach and yesterday afternoon his boys won the AICS (Arizona Independent Christian Schools) championship. Congratulations to the Providence Panthers! This past week has been filled with playoff games and working late (due to scheduling in the lab). So, I have been a little neglectful of my blog. However, after the boys won their final game, it made both my husband and I think about victory (and especially since the Olympics are on). Victory is really short-lived, if you think about it. The hightened moment only lasts a few hours. And of course, people will congratulate you, but only for the few minutes after the game. It just makes me think...why do we all strive for victory that only lasts a brief time? I don't have answers. But writing a book is sort of like trying to acheive success/victory. Months (and sometimes years) of writing/training lead up to a big finish (or sometimes a big failure). I guess, in some ways, writers are just like athletes.